Thanks for visiting! I'm a year-round storm chaser and photographer covering St. Louis, the Midwest, the Great Plains and beyond. I've spent weeks on the road for the last 26 years, driving thousands of miles in all types of weather, and plan to do it for as long as I'm able. My goal is to capture nature's dramatic side, and in doing so, provide visitors to this site with educational information and exciting photography/video about severe storms and extreme weather. I specialize in capturing imagery and video of tornadoes, lightning, St. Louis, MO and the Gateway Arch, storms and all types of extreme weather. I also sell fine art prints of my work via my photo gallery. December Illinois tornado outbreak - A tornado outbreak affects central Illinois on December 1, 2018. Hurricane Michael intercept - Experiencing Category 5 Hurricane Michael in Panama City, Florida. Incredible tornadoes at Dodge City, Kansas - The chase of a lifetime on May 24, 2016 with multiple highly photogenic tornadoes in southwestern Kansas. 90-Minute violent EF4 tornado in Kansas - Up close and personal with a long-lived significant tornado through Bennington, Solomon and Abilene, Kansas. Chicago Triple Skyscraper Lightning Strike - Lightning strikes all three of Chicago's tallest buildings at the same time - Sears (Willis) Tower, Trump Tower and John Hancock Center! Lightning strikes the Gateway Arch - Lightning hits the Arch in St. Louis twice during afternoon storms on August 27, 2014! San Andreas Fault Tour - A photo tour covering the major-earthquake-primed segment of the fault in southern California. 2017 Total Solar Eclipse - The total solar eclipse of August 21, 2017 viewed from southern Illinois. The El Reno, OK tornado of May 31, 2013 - A detailed account of the EF-5 El Reno, Oklahoma tornado of May 31, 2013, including video, images and other data. Can lightning strike the same place twice? - Busting this myth with some help from the Mythbusters themselves! Winter lightning and thundersnow - All about lightning and severe storms in the winter, even during snow! 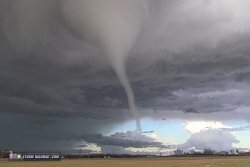 Storm Chaser Traffic and Behavior: Factual Information - A resource of evidence, including 79 full-day timelapse videos, showing how storm chaser traffic in the Great Plains isn't the problem it is often made out to be. I have all of my storm chasing imagery, video and and accounts organized by year and by category in my chase logs section. You can also browse images in the photo gallery section and videos in the stock footage section of the site. My video collection can also be viewed on the Youtube channel. The longest-running section of this site is the Extreme Weather Educational Library section, containing numerous articles about lightning, storms, severe weather and related phenomena. Subscribe to my Youtube channel or follow the Blog RSS/XML feed to keep up with the latest updates. After 9 years of defeats, my Gateway Arch nighttime lightning strike photo quest continues into 2019.